This is a elegant recipe, which can be prepared a head of time. Perfect for a dinner party where you want to make as much preparations a head as possible. You can also make one large gratin, then double up the amounts in the recipe. Soak cashew nuts overnight and rinse well before using. Blend garlic and thyme in a food processor. Add cashews, process. Add lemon and work into a paste. You need to start and stop to scrape down the contents inside the food processor bowl, several times. To get a paste takes about 15-20 minutes. Ideally let the paste stand overnight in the fridge. Add half the non-dairy cream to a pot on the stove, add the thyme & cashew paste, blend with the cream. Add the rest of the cream and ensure the sauce is smooth and very thin. Add the veggie stock and nutmeg. Let simmer together on very low heat for 10-15 minutes. Taste with additional lemon juice and salt if preferred. Slice the potatoes as thinly as possible. Coat 4 small pie dishes in oil. Add a layer of potato in the bottom of each dish. Then add a layer of sauce, then add a layer of potato on top. Repeat until the last layer. Add the remaining potato slices to a bowl and coat evenly with rapeseed oil. Then build the top layer on each small gratin. Brush the top with rapeseed oil. Sprinkle with salt and freshly ground pepper. Place in a preheated oven, 200 degrees C for 30-40 minutes. The top of the gratins should be golden brown and crisp. 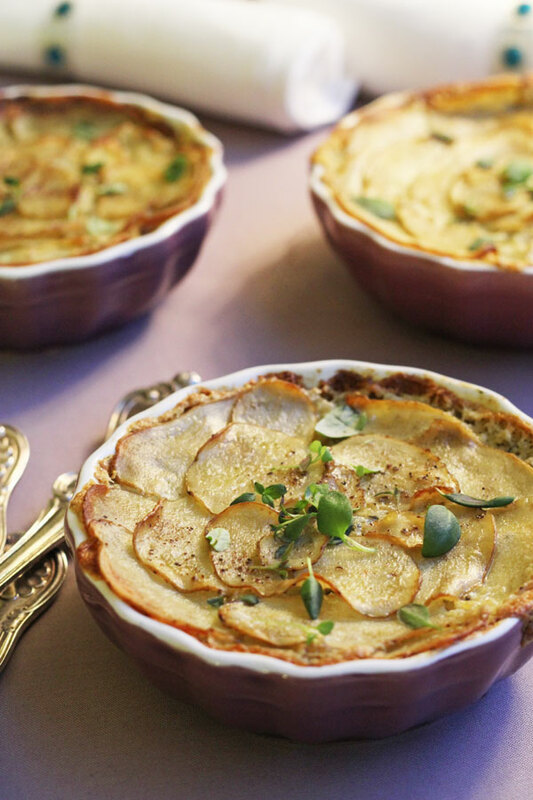 This potato and thyme gratin just look so delicious and comforting. It is all I am craving right now – and I LOVE that it is vegan especially! Yummy! I am looking for a good vegan potato gratin recipe for so long, thanks for sharing it! A comforting dish perfect for a cold winter day!